A dozen people were wounded recently when PUK supporters celebrated the fact that Jalal Talabani’s image was broadcast on TV whilst voting for the Iraqi elections. 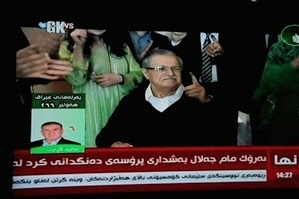 The sole fact that the leader of the PUK was seen on video for the first time since his stroke in December 2012 was enough for big celebrations. It was the shooting in the air that caused the casualties in Sulaymaniya, and fear and distress amongst the foreign community. How high emotions run when it comes to politics in Kurdistan, baffles most foreigners. For most of us, politics are just a tool to run our countries. So much so, that many people even do not bother to go and vote because they are dissatisfied with what politicians are achieving. Even though Kurds might feel the same about their politicians, and especially about the fact that eight months after the last elections they still have no new government – yet they still go and vote in droves. Not only that, many people dress up, wear their best Kurdish costume when setting out to vote. I’ve been told that voting is a treat, a feast. In the West, many just see it as a bore, or at best a duty. The re-appearance of a statesman, even of someone with Talabani’s stature, would never rouse so much emotion as in Kurdistan. But then I suppose we would never have been without any real news about his health as long as the Kurds were; our highly competitive media would not have allowed that. I often wondered why Kurdish journalists did not travel to Germany to get the scoop of a lifetime: the first moving images of a statesman who some even said was dead. For foreigners, it is hard to understand that emotion, because we have become used to democracy and its system – which brings about a regular change of politicians. If our prime ministers stay on for more than two terms, in most western countries that is unusual. Party leaders also come and go every so many years. Nobody would be staying in function as long as Iraqi politicians do. Staying that long, changes politicians into icons, into everybody’s ‘uncle’, into subjects of concern and gossip. They become figureheads that can hardly be replaced anymore – as is the case with Mam Jalal, as Talabani is lovingly called by his supporters. In the West we are used to new politicians popping up. It could be healthy for Kurdistan, if that would happen here too. It means more talents get a chance to blossom, and the young generation gets more influence. Yet changing seats more often will not change the way Kurds feel about politics. Because that feeling comes from the sweet taste of freedom and self-determination, after so many eras of suppression.